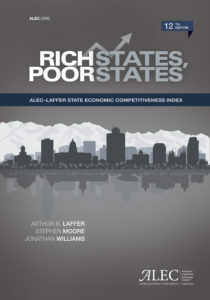 Current values and ranks for the 2019 edition of Rich States, Poor States. Overview of states' Top Marginal Corporate Income Tax Rate over time. Historical state ranks for Top Marginal Corporate Income Tax Rate across editions of the Rich States, Poor States. Historical values for Top Marginal Corporate Income Tax Rate. The years listed correspond to the actual data years, not necessarily the publication of Rich States, Poor States.